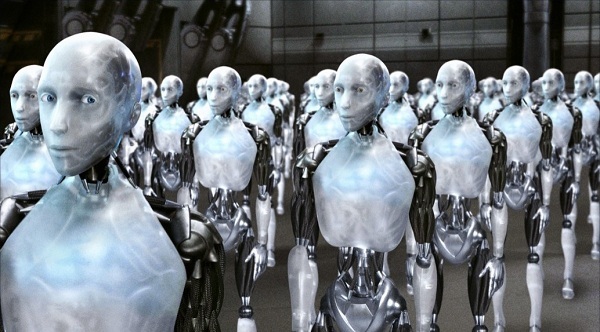 What is it about robots that manages to inspire us even as they creep us out? Somehow, we just can’t stop pushing the envelope to make them smarter, faster, and more versatile; even as we entertain fears that they might someday replace us. And at the forefront of this expanding research is the desire to create robots that can not only think for themselves, but also maintain and/or repair themselves. 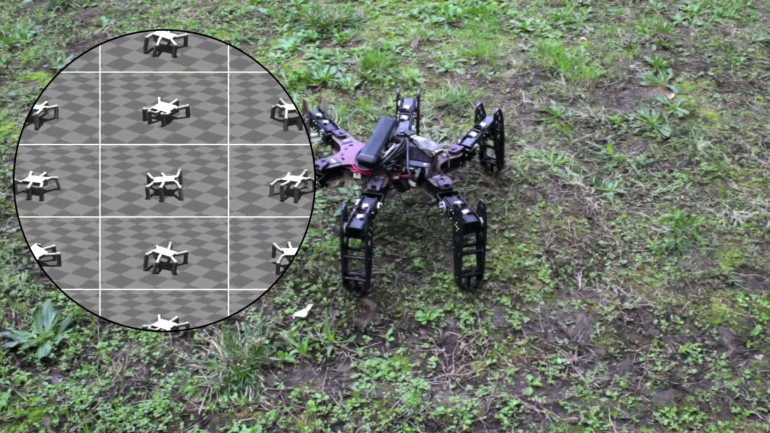 Case in point, the new hexapod robot that was developed by researchers from Pierre-and-Marie-Curie University, in Paris. Built with survivability in mind, this robot is the first of its kind to be able to address structural damage, adapt, and carry on. In a world where robots can be very expensive, the ability to keep working despite the loss of a component is invaluable. To do this, the hexapod uses what the team refers to as a T-resilience (the T standing for Transferability-based) algorithm. 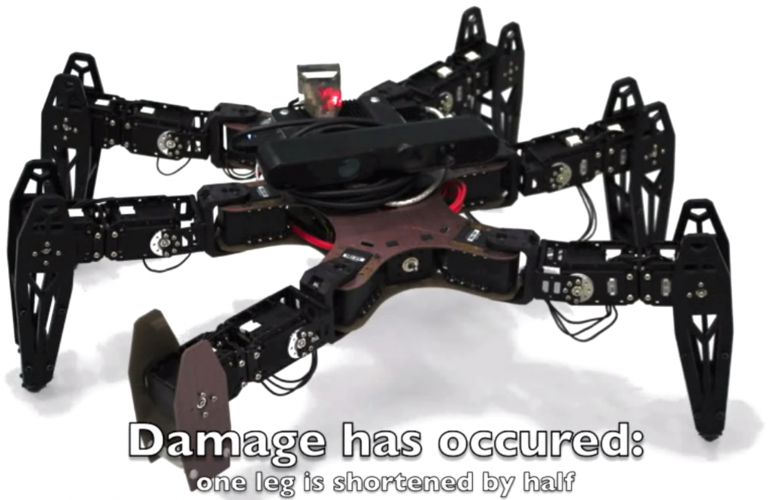 With six legs, the hexapod moves along quite at a steady 26 cm/s. But once it loses one its front legs, it manages only 8 cm/s. But after running 20 minutes’ worth of simulations and tests, the robot works out a new way of walking, and is able to more than double its speed and cover 18 cm/s. Essential to this approach is that the robot is programmed with what amounts to an understanding of its ideal undamaged anatomy. Previously, roboticists believed that it was necessary for a robot to analyze its new gait to diagnose the damage and compensate accordingly. But the team argues that a robot can arrive at an answer more quickly by generating a number of possible alternatives based on an undamaged state, and then testing them. The robot spends 20 minutes testing 25 alternatives, during which a ranging camera feeds data to a separate algorithm which works out the distance traveled. In this way the robot is able to compare its actual performance with its theoretical performance, finally settling for the closest match: a gait which recovers much of the lost speed. This resilience could one day be a godsend for crew that rely on robots to survey disaster zones, conduct rescue operations, or deal with explosive devices. The ability to carry on without the need for repair not only ensures a better history of service, but makes sure that a task can be completed with subjecting repair crews to danger. And then there’s the RHex robot, a machine designed with versatility and performance in mind. Much like many robots in production today, it utilizes a six-foot (hexapod) configuration. But it is in how the RHex uses its appendages that set it apart, allowing for such athletic feats as long jumps, pull-ups, climbing stairs and even scaling walls. This is all made possible by RHex’s six spinning appendages, which act as a sort of wheel-leg combination rather than traditional feet. These legs provide for a form of motion that exceeds standard locomotion, and allow the robot to go places others could not. 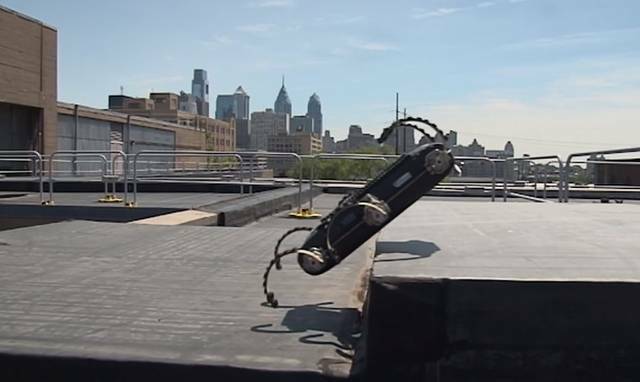 The robot was created through the collaborative efforts of Aaron Johnson, an engineering graduate student at the University of Pennsylvania, and professor Daniel Koditschek at Penn State’s Kod*Lab. What we want is a robot that can go anywhere, even over terrain that might be broken and uneven. These latest jumps greatly expand the range of what this machine is capable of, as it can now jump onto or across obstacles that are bigger than it is. Here too, the potential comes in the form of being able to mount rescue missions in rugged and hostile terrain. Thanks to its versatile range of motions, the RHex could easily be scaled into a larger robot that would be able to navigate rocky areas, collapsed buildings, and disaster zones with relative ease, and would have no trouble getting up inclined surfaces of hopping over gaps and holes. Granted, we’re still a long way from the Nexus 6 or NS-5, but real advances are far more impressive than fictional representations. And with parallel developments taking place in the field of AI, it is clear that robots are going to be an integral part of our future. 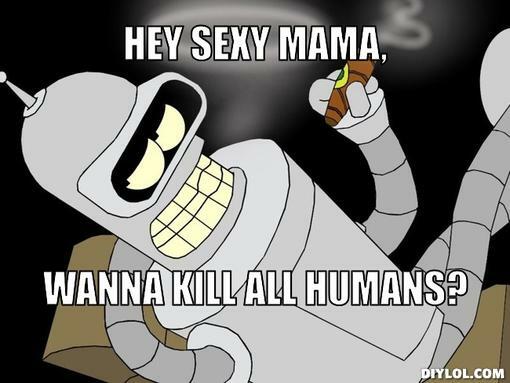 One can only hope its a happy, docile part. When it comes time for science fiction to give way to science fact, we could all do without certain cliches!